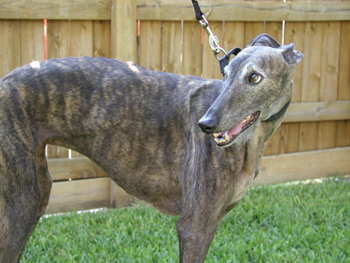 Talulah is a petite, 10½-year-old dark brindle female born November 1997. Her registration number cannot be identified at this time, but her right ear is 117B. 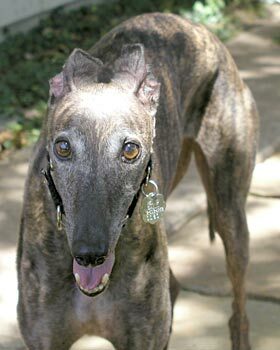 Talulah was in a home for 9 years, but was surrendered to GALT, through no fault of her own, as the previous owners could no longer care for her. 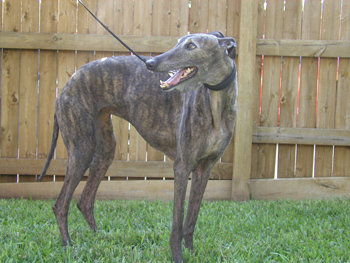 Talulah arrived with blocked salivary ducts. Dr. Katherine Wells of the Dallas Surgery Center performed surgery on July 2 removing her right salivary gland along with sublingual glands. The surgery went well, and Talulah's chin area is almost back to normal. She may be small, but this is one feisty little girl! It is not known at this time if Talulah is small animal or cat tolerant.